In recent weeks I’ve been consistently guilty of committing one of the seven deadly sins. Maybe envy? Not a chance. No, ladies and gents my deadly sin is good old gluttony. Usually my diet consists of relatively healthy items mixed in with the occasional ( ok maybe a tad bit more than occasional) indulgence, but lately, I’m finding every excuse under the sun to regularly consume items that are horrifyingly bad for me. Cheese pizza? That’s my calcium intake for the day. Burgers? I can’t live without protein, right? The list goes on and on. I never thought I would say this about any of these items, but for this week, I’ve had enough pizza, pasta, sweets, and treats. Right now I want something light and refreshing but still totally satisfying – and that’s where this salad comes into play. I’ve taken some of my favorite ingredients, added in some peppery arugula and have come up with a pretty healthy entrée. 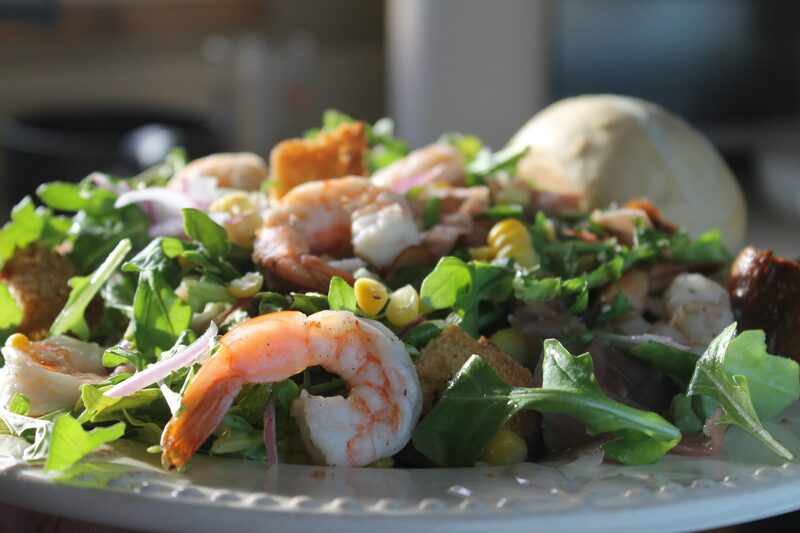 Roasted shrimp and meaty prosciutto fill you up and make this salad feel like a complete meal that won’t weight you down. 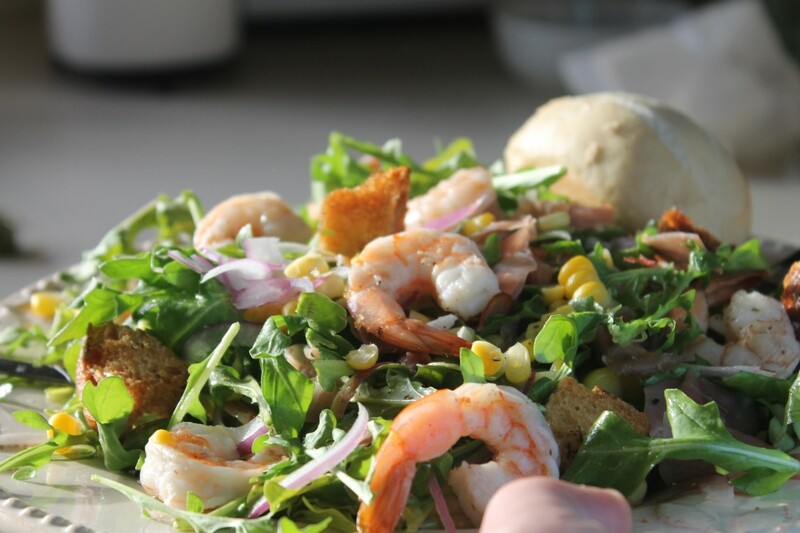 Finish off with some homemade garlic croutons and citrusy lime vinaigrette – two finishing touches that really tie the whole thing together. Who knew a salad could so easily curb my gluttonous tendencies? Roasting is always the way I go when adding shrimp to a dish; it gives it so much more flavor than boiling or sauting. Be careful though because they are very easy to overcook. If your shrimp are curled up and look like the letter o, you will have tough, chewy shrimp! Pretty c’s are the way to go. On to the croutons! 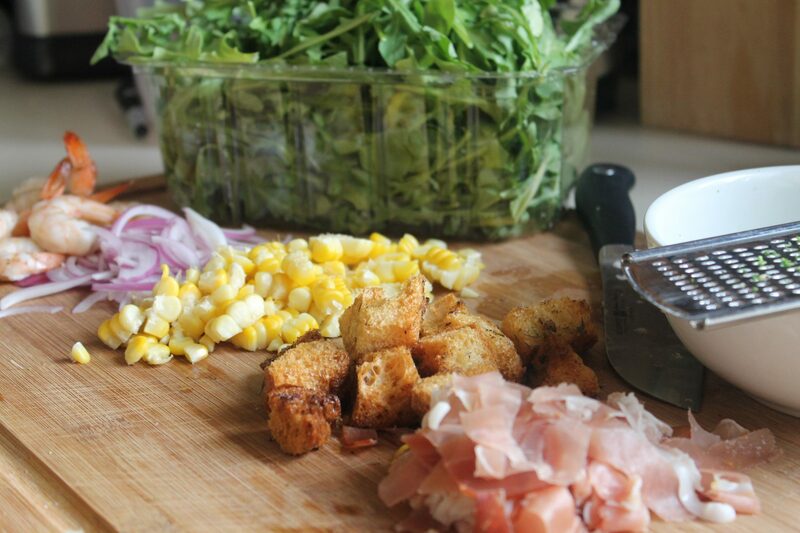 Homemade croutons are the absolute best. Trust me. You will never buy storebought croutons again after making them yourself at home. Completely worth the extra effort. Throw in some thinly sliced red onion and corn straight off the cob and you’re good to go. Tossing everything together is the last step! Mix all ingredients together. Season with salt and pepper. Mix zest, juice, honey, salt, and pepper. Slowly whisk in olive oil. Preheat oven to 325 degrees. Toss bread with oil in mixing bowl until all pieces are coated. Add spices. Toss until evenly coated. Spread on baking sheet. Bake for approximately 20 min or until light brown. 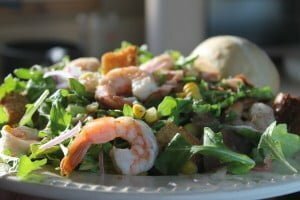 5 Responses to "Roasted Shrimp, Prosciutto, and Arugula Salad with Lime Vinaigrette"
Nicole, The recipes sound delicious! I can’t wait to try them. Maybe tomorrow for dinner with a crisp white. I’ve always said you’re fearless in the kitchen. What a great way to share your passion with all of us. Congrats! Made both the shrimp salad and the avocado egg rolls for dinner last night. They were delicious! Nice and light, but very satisfying. We loved the cilantro dipping sauce. Randy agrees that they’re both make-agains. Thanks! Yummmy! I look forward to making this dish, it sounds so delicious! PS: I love the cooking tips! Great dish! The prosciutto is great opposite the shrimp.